Utilizing index annuities as a safe growth tool in your portfolio is at once a simple and a sophisticated concept. Index annuities are designed as safe investment vehicles that protect and grow money, insulate from market volatility, and give you options in your retirement portfolio. These benefits are simple to understand and convey. It gets sophisticated when you look at the index annuity in the context of your overall financial portfolio. Many retirees who research their options quickly realize that a low cost, high quality index annuity is superior to bonds for a safe-money or fixed income allocation. This is a concept we explore further in our page on Index Annuities as Enhanced Bonds, and will touch on in this page also. But before diving in too deep, lets understand that there are two main goals that people look to accomplish with index annuities. They are growth, and income. Using the index annuity contract as a base and adding a lifetime income rider is a popular product design choice for insurance companies, and it’s a popular product for agents and consumers as well. But permit me to focus another page on index annuities for lifetime income, because it’s an expansion of many of the topics covered on this page, and to put them both together on one resource would be an awfully long read. Lets stay focused. There are over 400 different index annuities on the market today, and each has a design tweak, or a feature, or a calculation methodology geared to a specific goal. It can be difficult to distinguish differences between contracts from various carriers, and it can even be a challenge to differentiate contract variations from the same carrier. Indexed annuities accomplish these two goals through their indirect investment in the markets- your principal is never at risk, but the yield is tied to appreciation in a stock market index. Among these are the NASDAQ, the DOW JONES, and the S&P 500, as well as several proprietary and esoteric measures of performance. Bottom line, insurance companies tie the yield on your annuity contract to the performance of an outside index, and offer you a guarantee of your principal so your money does not lose value. Buy in – the first step is the purchase, where your premium is taken in and invested by the carrier in their fixed account holdings, like bonds and real estate mortgages, and other safe assets. Commissions, distribution costs, and riders all impact the net amount of money the insurance company has available to invest. Accumulation Stage – in this stage, the invested premium earns the general account’s fixed interest credit. It’s always an option in a fixed index annuity to take this fixed account yield, however many contract holders focused on index annuities for growth instead elect to allocate their account to one or more index – linked performance measures, to earn a higher level of growth if the underlying outside index grows. Growth on a Tax Deferred Basis – Fixed index annuities grow and accrue tax deferred, so year over year, your account value grows and compounds without the erosive force of taxes. Distribution Stage – In almost all contracts, account holders have the option for partial withdrawals without any penalty every year. Investors using index annuities primarily for growth will be satisfied with the free withdrawal provision for liquidity on an as needed basis. However, in addition to free withdrawals, there are of course index annuities with income riders that give longevity protection and options for lifetime income, though these may come with fees. The idea is to deploy your safe- money allocation into an indexed annuity in place of bond holdings, but do so in a way that maximizes growth without risk of loss to your principal. One of the principal advantages of a high quality, low cost index annuity is an alternative bond allocation within a retirement portfolio. Bonds carry interest rate risk, lower yield, credit concentration risk, and price sensitivity to yield, but an index annuity addresses each of these negatives. Be sure to read our page on index annuities as enhanced bonds for more details. Who Buys Index Annuities for Growth? In addition to a safe allocation alternative to bonds, index annuities are a compelling safe growth option. A recent Allianz study found that 2/3 of retirees fear running out of money more than death itself. Using high quality and low cost indexed annuities for safe and steady portfolio growth is the perfect way to ease the fear of running out of money. Your principal is invested in safe assets, but wrapped with an insurance company guarantee against loss, and your earnings grow and compound tax deferred. Growth is locked in each year and can’t be clawed back. Investors most interested in growth oriented index annuities appreciate the value of the guarantee of principle protection, and understand that annuities offer a reasonable rate of return in light of the safety and guarantees. They may be individuals who typically like bonds or stocks, but who want the security that comes with knowing the integrity of the portfolio principle is assured. NAFA has sponsored an academic paper written at Wharton on the subject of Index Annuity returns over the past few decades. This is called “Real-World Index Annuity Returns.” For investors who want to better understand how these particular annuities have fared in the real world since their inception, this is the paper to study. It is important to remember that any financial product’s pros and cons are intimately tied to the individual using the product. The product may not be bad in and of itself… but it might not be right for you. So take the pros and cons in the context of how an individual uses the contract, and look at how well this form of annuity will assist in meeting your own goals. Principal protection from stock market volatility – whether or not the stock market rises or falls, these annuities benefit from complete principal and credited earnings protection. Guaranteed control over future income – with a Fixed Index Annuity, the contract owner has the security of knowing their principal is safe, and can turn it into income at any time in the future. Tax-deferred growth – this product benefits from tax-deferred advantages as it gains in value and grows. Income taxes will not be due on any of the gains until distributions are taken. Surrender periods – agreeing to a contract which will tie up the principal for from years to a decade or more is a choice that is not appropriate for all individuals. For some people, the annual free withdrawal period will not be sufficient to meet their needs. Complicated crediting methods – while fixed index annuities are less complicated than some competing annuity contracts, the sheer numbers of choices, strategies, and available options make the product more complicated than some other investment alternatives. Consumers who start out in the weeds looking at the range of options too often give up in confusion. Be sure to first establish the goals, and then decide if this product will meet those goals, before looking at the details. Tax complications – while fixed index annuities benefit from tax deferment, taxes will eventually be due when income or distributions are taken. Annuities are taxes as ordinary income as well, but investors should consult with their tax professional before simply moving money around. 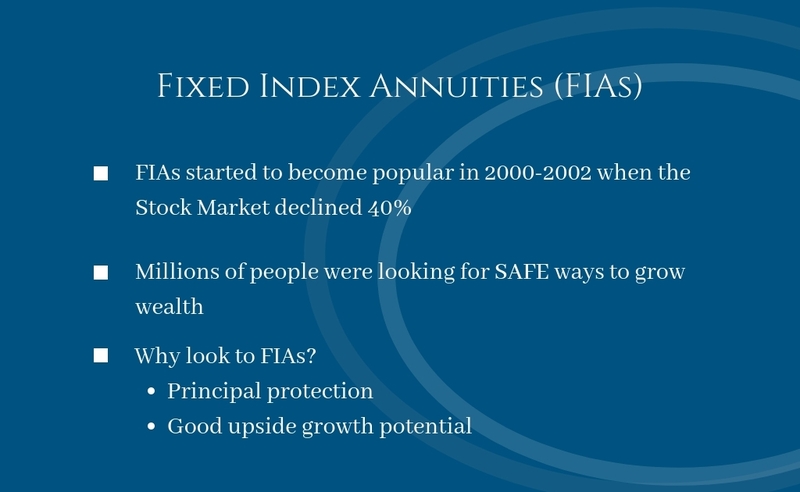 There are many benefits of growth oriented fixed index annuities. They offer principal protection, reasonable yield, safety, and flexible withdrawal options. Get in touch with us to help identify your goals and the find the best options. We are here to help.